Cattle Krush is $75/month or $900/year for non-members. Iowa Cattlemen's Association members receive the service for FREE! Click here to join or renew your ICA membership before taking advantage of this amazing offer! Cattle Krush, by Performance Livestock Analytics, is a marketing tool to help producers, lenders and commodity brokers to give them the insights needed to never miss profit opportunities. Within the application, there are five tools to help manage the buying and selling of your cattle. 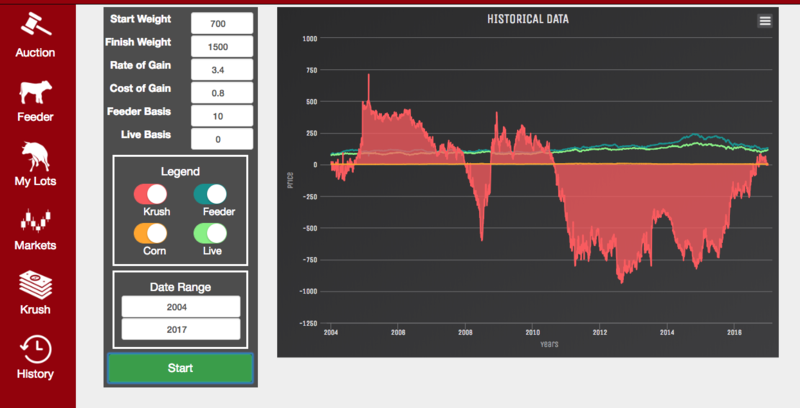 Cattle Krush is designed to assist producers by looking at the Chicago board of trade futures markets bringing in the feeder, live and corn prices, running them through an algorithm to provide profit opportunities. "Auction Advisor" allows you to receive real-time profits per head based on the Chicago Board of Trade. This can be utilized in the auction house, online auctions or spot-buying. "My Lots" allows you to import the lots currently on feed to know exactly where you're at and watch for profit opportunities. - Click on Sign Up! - Use the discount code: "iacattle"
When signing up, you will be asked to provide a credit card number. YOUR CREDIT CARD WILL NOT BE CHARGED as long as you use the discount code "iacattle" and your membership is current with the Iowa Cattlemen's Association. If your membership expires, you may be charged for Cattle Krush. Once an account is created it can be downloaded to any IOS device through the App Store or accessed on mobile or desktop through the Google Chrome web browser. For questions and support contact Performance Livestock Analytics 515-337-2187.